We’re looking forward to snuggling up warm inside as the weather turns icy outdoors! 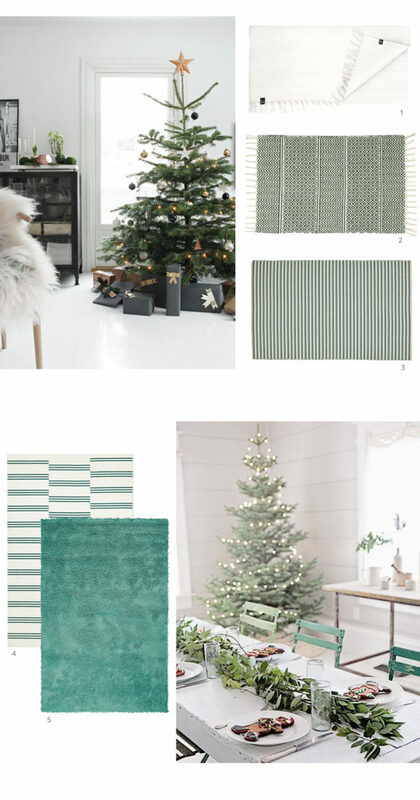 To keep our homes ever-green this Christmas, we’ve collated a selection of green and white rugs perfect for a festive interior. We’ve even added a little interior inspiration too! 1- ‘Saro’ cotton rug in optical white (140cm x 200cm) – £134, Scandi Living. We can’t get enough of a white floor runner, they blend in seamlessly as winter descends and we want to get our Christmas decor out! This cotton runner from Scandi Living is perfect for a minimalist home. We suggest pairing it with simple white and silver decor, and candles of course! 2- ‘Iris’ dark green patterned floor runner (70cm x 240cm) – £79, Skandihome. Patterned rugs are great to liven up interiors, even with festive decor coming to the fore during December. This dark green geometric rug from Skandihome jazzes up floors without taking too much attention from the tree! Pair with pale wooden floors, and add handmade wreaths and garlands to walls and stairs for a natural Scandi festive look. 3- ‘Vestbirk’ green flatwoven rug (80cm x 150cm) – £30, Ikea. Stripes are always a staple in Scandi home decor. Our green and white pick this month is the Vestbirk flatwoven rug from Ikea. Pair with rustic style wooden decorations and warm Christmas lights to get that festive Hygge atmosphere going! 4- ‘Stripes’ rug in cream and green (185cm x 275cm) – EUR699, Nordic Knots. We love this modern-look rug in cream and green from Nordic Knots. It would match perfectly with fur-topped wishbone chairs and neutral festive interior accessories. 5- ‘Shoreditch’ malachite rug (170cm x 240cm), £925, Designers Guild. This is definitely a statement rug from Designers guild. The soft texture is perfect for sinking your toes into while enjoying a glass of Glogg in the run up to the big day! We’re envisioning a crackling fire in the background, and accents of gold or brass in the room. For more festive interior inspiration visit our Pinterest board here.